p53 is a transcription factor that regulates the cell cycle and hence functions as a tumor suppressor. p53 has been described as "the guardian of the genome", referring to its role in conserving stability by preventing genome mutation. p53 has many anti-cancer mechanisms: activating DNA repair proteins when DNA has sustained damage, holding the cell cycle at the G1/S regulation point on DNA damage recognition, initiating apoptosis if the DNA damage proves to be irrepairable. Human p53 is 393 amino acids long and has three domains: N-terminal transcription-activation domain (TAD), which activates transcription factors. 2) central DNA-binding core domain (DBD) 3) C-terminal homo-oligomerisation domain (OD); tetramerization greatly increases the activity of p53 in vivo. Mutations that deactivate p53 in cancer usually occur in the DBD and most of these mutations destroy the ability of the protein to bind to its target DNA sequences. The activity of p53 is regulated at different levels and includes control by multi-site phosphorylation. 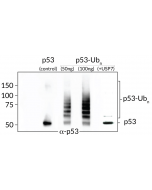 p53 is phosphorylated (Ser6 and Ser9) by casein kinase 1δ and casein kinase 1ε both in vitro and in vivo. Acts as a tumor suppressor in many tumor types; induces growth arrest or apoptosis depending on the physiological circumstances and cell type. Involved in cell cycle regulation as a trans-activator that acts to negatively regulate cell division by controlling a set of genes required for this process. One of the activated genes is an inhibitor of cyclin-dependent kinases. Cancer induction seems to be mediated either by stimulation of BAX and FAS antigen expression, or by repression of Bcl-2 expression. Implicated in Notch signaling cross-over.